Reached the point in my life where my 18 months old daughter has become way too quick and unpredictable that anything hobby related could be left on table for a one second. Now back to work ’cause there is new epic campaing waiting for my input. Very nice! Do you ever feel cramped by the reduced space? I’ve got some sticky fingers on the way and am dubious about my current setup.. Looking good. Going to look forward to the progress. 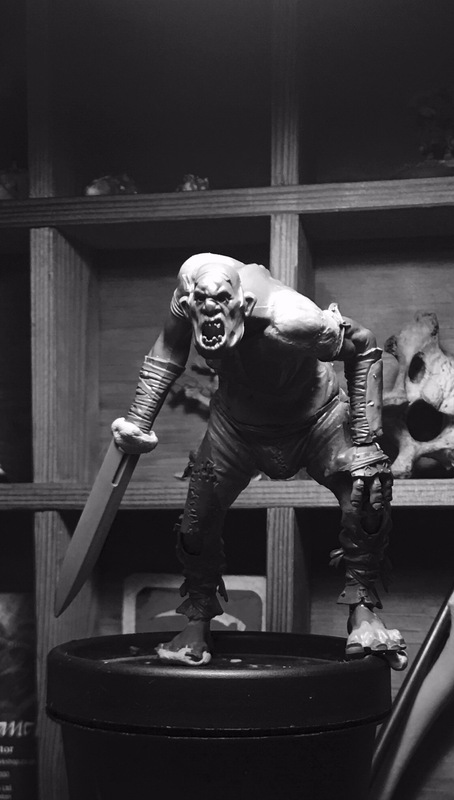 I love the pose of that Gargant so much!!! What a stylish solution you got! I have the same problem but treefold…. Found a suitable way to keep my stuff safe, but the lack of space is really annoying. Especially when you were used to a spacious working area. Good Luck with your familiy. Luck is what families need! All the best wishes for your family too hrld! Such a beautiful setup and nice solution to the challenge. Love all the small details and items. Turning into a Cabinet of Curiosities! Very nice. Wish my work space was a zen- like as yours. Very nice solution. I just learned our little one can reach the top of the desk, climb up the chair and open drawers by herself, so *sigh*…it’s definitely time to make the office kid-proof. I’ve been putting everything away in the closet after each session, but that’s a pain to unpack/pack up each and every time. Probably a really good idea to invest in a lockable desk. Just came across your blog and i’m happy to see someone else using the same setup as me! 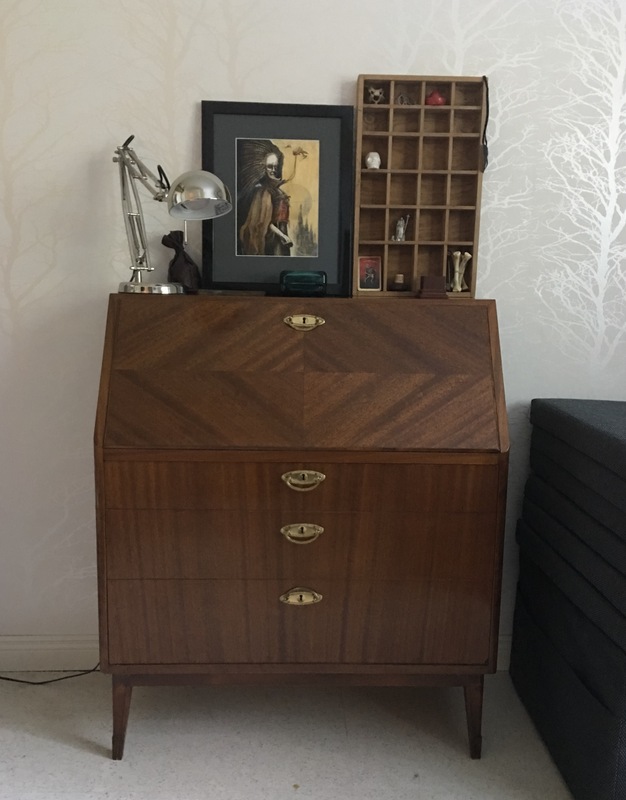 I picked up a writing desk similar to this from a charity store, it keeps the living room nice and tidy whilst allowing me to paint whenever i want, i’ve got the same lamp from ikea too. I also trimmed an A2 cutting mat and attached it to the drop down panel to save the wood from paint, cuts and water splashes. 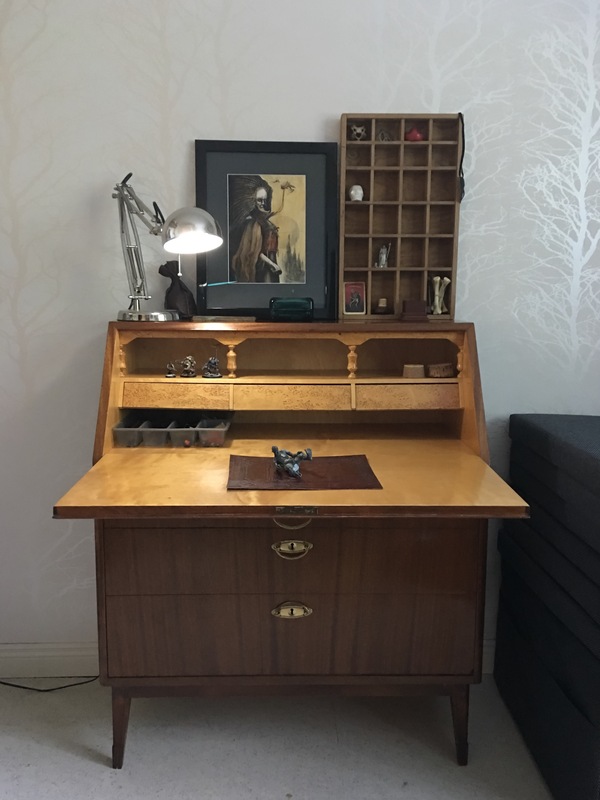 I’ve got an old roll-top desk that’s going to become my painting desk once we move house. It’s lovely but by God its big. Maybe too big. A more compact solution such as that might be worth looking into! Been a long time since we last chatted but I must say yourself and Katie continue to inspire myself and The Chaos Manifesto. Your desk is actual epic ans makes me Green with envy beyond belief. First off when it’s close not only does it look posh but takes up a small footprint. The cubby holes are fantastic as well for either storing finished modeks or WIP.